Luxury Villa 22 is a stunning and elegant villa located in the heart of Rome, at Santa Maria in Trastevere. 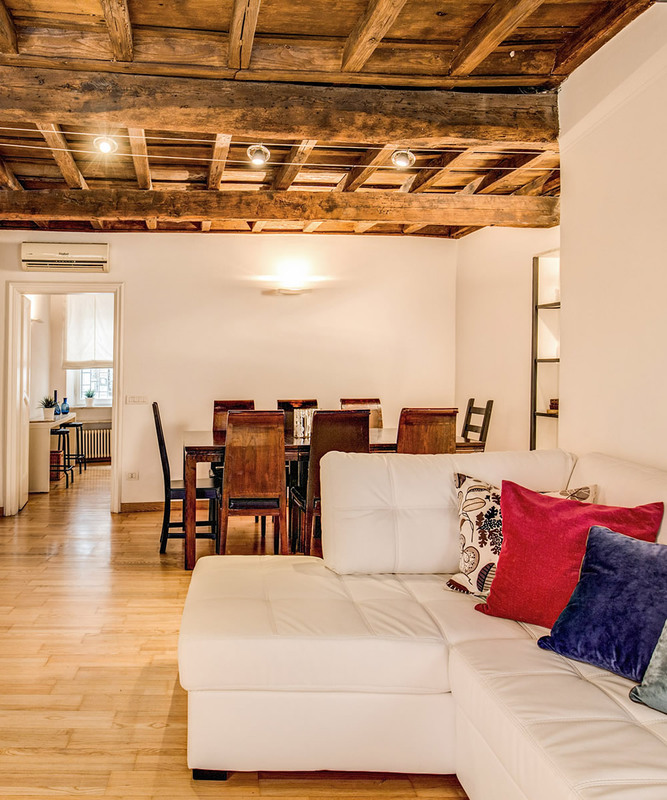 The property is the result of a meticulous restoration and extension of an early 19th-century residence; perfect location within walking distance of many attractions as Piazza Navona and Campo di Fiori. Cozy and traditional neighbour, Trastevere offers the best restaurants, Caffes, enotecas, movie theatre and small shops. Luxury Villa 22 is 170 sqm, set on 3 floors, can accommodate up to 8 people for a total of 3 bedrooms and 3 bathrooms. Ground floor: Master bedroom with double bed, fitted with elegant Jacuzzi up to 4 people, relax area and bathroom ensuite with shower. First floor: This floor, which is accessed via a central staircase, is dedicated to the living area. The living is furnished with double sofabed, design working fireplace. large hideaway screen, video projector and sound system. Another part of the first floor is dedicated to the dining area, which features a hand made wood table up to 8 people. The kitchen is finely furnished and equipped with the latest appliances (oven, microwave, fridge, dishwasher, washmachine, toaster and coffee machine). Second floor: The top floor has two double bedrooms. One with double bed, private balcony with seats for two, modern ensuite bathroom with Jacuzzi. The other bedroom with two twin beds ( can be set up as double bed too) and with adjoining bathroom with shower. Included free Wi-Fi throughout the property, air condtioning, heating and TV in all bedrooms.